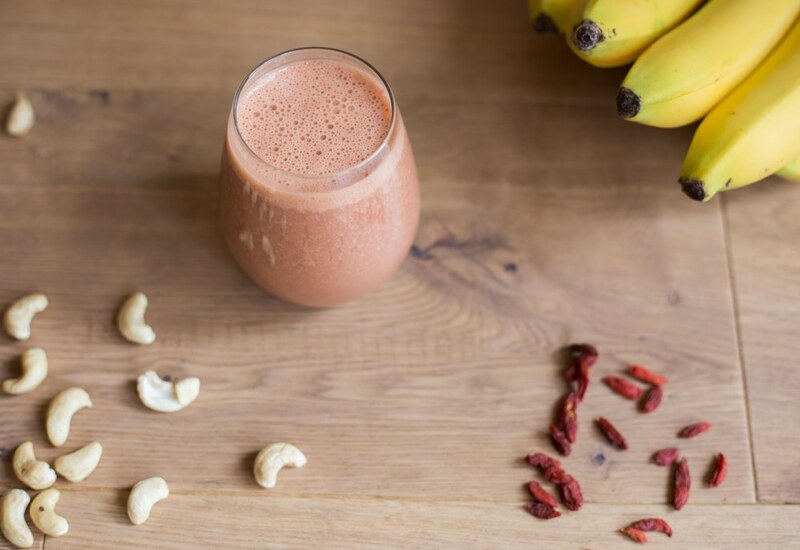 Goji berries and pomegranate give this smoothie an appealing color that it looks just as good as it tastes. It's easy to throw together for breakfast or a quick afternoon snack, and also happens to be vegan and packed with vitamins and nutrients. Using raw cashews soaked in water makes for a super creamy consistency and adds protein, keeping you full until lunch. Frozen banana adds potassium, while pomegranate juice adds tangy flavor and tons of antioxidants. Goji berries are veritable superfoods, allegedly boost your immune system and brain activity, protect against heart disease and cancer, and improve life expectancy. They also contain vitamin C, vitamin B2, vitamin A, iron and other antioxidants. Pomegranates have strong anti-inflammatory effects. Be sure to use unsweetened pomegranate juice (not concentrate) for a smoothie with no added sugar. For a beverage with more protein, add 1/2 cup almond or cashew milk or a scoop of vanilla protein powder. Per Serving: 275 calories; 5g fat; 58.6g carbohydrates; 4g protein; 0mg cholesterol; 110mg sodium. The blend of cashews with the banana and berries is really good. I prepped these in advance and keep them for later in my fridge. I put some greek yogurt in this for some extra protein and creaminess. this was so refreshing and tasty. i didn't have time to soak the cashews so just used them as is. worked fine, maybe had a little more texture than it was supposed to but i didn't mind. This smoothie was so good! The cashews gave it a really creamy texture. In addition to pomegranate juice, I also added pomegranate arils. Delicious!